The DuoTester combines the Presidium Reflectivity Meter and the Presidium Gem Tester/Colored Stone Estimator into one convenient identifying instrument, giving you portable Diamond testing with Thermal Conductivity and Reflectivity measuring in the same affordable instrument, the only tool on the market that provides the user with two proven tests for Diamonds and the ability to differentiate between similarly Colored Gemstones! Double the confidence in testing for Diamonds against all known Simulants, including Synthetic Moissanite! The easy-to-read dial of the DUOTESTER (see close-up photo) is calibrated to indicate the differences in thermal conductivity of the most popular gemstones and simulants. Simply touch the tip of the thermal conductivity probe pen to a mounted or loose stone. Diamond is easily identified by any reading in the green area of the dial, and colored gemstones can be easily differentiated from one another by the clearly labeled zones provided in the red area. Even coated gemstones can be accurately tested. The Thermal Conductivity test of the Presidium DuoTester can be applied not only to Faceted gemstones, but also Cabochons, as well as Gemstone rough. 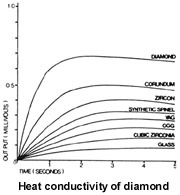 Diamond and its simulants reflect light proportionally to their respective refractive index. The PRESIDIUM DUOTESTER provides the user with a digital reflectivity meter and an easy to use Simulant Reflectivity Chart. The reflectivity number from the meter is simply cross-referenced with the chart to identify the stone. An unknown gemstone can be tested for its thermal conductivity and, if necessary, the results can be confirmed with a quick and simple reflectivity test. 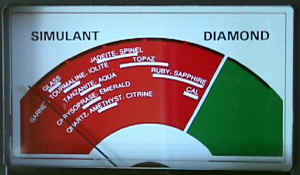 All stones indicated as diamond by the thermal tester should be tested with the reflectivity meter to test for Synthetic Moissanite, thus providing double the assurance for the same price. Your purchase will also include an expanded Reflectivity chart covering the entire universe of stones, 54 species in all, from Glass through Colored Stones, and into Diamond and its various simulants. This Reflectivity test is designed for use on Faceted stones only, but this instrument tests across the whole range of gemstone species, from lowly Glass, through the full range of Colored stones, into the Diamond simulants, and through Diamond and Synthetic Moissanite. Easy Fail Safe Calibration The PRESIDIUM DUOTESTER comes complete with built in diamond and simulant test discs for easy calibration of the thermal tester. Calibration of the Reflectivity Meter is made easy with the optional, built-in Diamond simulant set, consisting of seven different species of faceted gemstones, including High Zircon, Strontium Titanate, GGG, YAG, Cubic Zirconia, Synthetic Spinel, and Synthetic Sapphire. Convenience The thermal probe pen includes a metal warning detector that emits a audible buzz if the gem mounting is accidentally touched. The DuoTester can be powered by 5 AA alkaline batteries or by the 100V/240V Global A/C electrical adapter provided. Guaranteed Quality The PRESIDIUM DUOTESTER is manufactured under rigid quality standards. The user is assured of the highest satisfaction and dependable service from this PRESIDIUM instrument. Each DUOTESTER is tested for functionality before shipment. For the DuoTester version with the set of Diamond simulant gemstones, or if you just need the Set of 7 Diamond Simulants add-on, choose that option from Related Products.